So Jay Leno has a week's worth of new Dan Quayle jokes. At a school here, everyone was quite hush-hush the day after the visiting Vice President spelled potato wrong while directing a spelling bee. ..... Reporters stood around today for hours outside of the house where 12-year-old William Figueroa lives. He has become a national celebrity for having spelled the word correctly on the blackboard, only to have Mr. Quayle, holding a flash card with the word spelled incorrectly, encourage him to add an E at the end. On Friday, Barack Obama, as NewsBusters John Stephenson reported, told an Oregon audience that "I've been in 57 states, (with) I think one left to go." But a Times search on "Quayle potato" (not in quotes) from June 10 to November 10, 1992 shows that the Old Gray Lady's reporters, columnists, writers, and editorialists went back to the story another 38 times between that first story and shortly after Election Day. The Associated Press? Surely you jest (here and here). 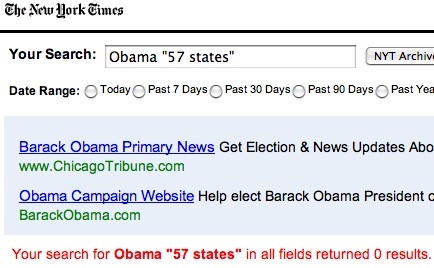 A Google News search on the first of the two terms returned 27 results, only four of which could be considered Old Media outlets: at a Reuters blog; a Bloomberg "Campaign Notebook" item carried at the Houston Chronicle; a Los Angeles Times blog entry; and an MSNBC "First Read" blog entry. Only Reuters gave the story headline coverage. The others buried it in a series of presidential campaign-related items ("snippets," if you will). It was the fifth topic at Bloomberg, the third at the LA Times, and made up the last two paragraphs of a 1250-word entry at MSNBC. Old Media's treatment of the story thus far indicates a strong likelihood that Obama's arguably dumber gaffe has not found its way into the primary web sites or print editions of most newspapers, and that it never will. Has the flub made it, or will it make it, to network and/or cable newscasts? The prognosis is: Doubtful. By contrast, a Google News Archive Search on "Quayle potato" for the period from June 10 to November 10, 1992 -- likely an incomplete rendering of the news that was available at the time -- returned over 850 items (link is to Page 43 of a 20-per-page list). A scan of the results indicates that the press not only went into saturation mode when the story broke, but kept going back to it at a fairly sustained pace until Election Day. 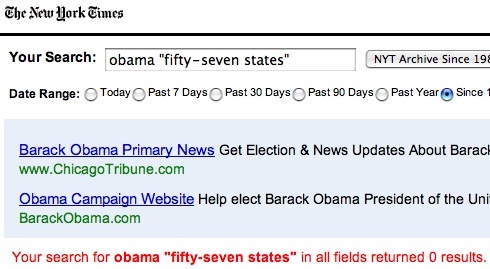 Will anyone in the traditional press corps even allow anyone to mention Obama's "mis-state-ment" in a month? Will CNN's John Roberts add "no 57-state zone" to his "Wright-free zone"?